Food is always a focus on an African safari and the day starts with hot drinks and homemade rusks before the early morning game drive. Your ranger normally stops during the game drive for another refreshment stop and leg stretch. On return it's a slap up breakfast with everything you desire to eat to set you up for the day. Lunch is a buffet of starters, salad and hot dishes, usually featuring one of the speciality soups made fresh each day by the sous chef. The chefs are not only kept busy preparing food, they are often seen in the office typing out recipes for guests who request them, like the delicious Kapama Lodge mushroom soup or banoffee pie. A la carte evening meals include local and international dishes with specialities like tender rack of lamb or gentle curries and flavourful seasonal vegetables. Dinner is served in different locations chosen according to whim and weather; you may be in the subtly lit main dining room, eating by lantern light in the outdoor boma, or by the light of the moon and stars at a hidden location deep in the bush. Kapama Private Game Reserve occupies a vast area between the northern Drakensberg Mountains and the Greater Kruger National Park. It is the largest single-owner game reserve in the region, and is perfectly situated to receive guests flying into Eastgate Airport (Hoedspruit). This airport is just minutes from the reserve and Kapama include free airport transfers in open safari vehicle direct to any of the four lodges in Kapama; Kapama Lodge, Kapama River Lodge, Kapama Buffalo Camp and Kapama Karula. These camps and lodges can accommodate a total of 208 people between them. 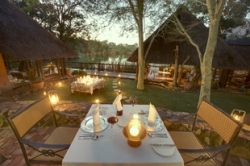 Kapama Game Reserve is in Limpopo Province, an area renowned for superb safari vacations. Kapama's 13000 hectares has all the big game of Africa with 42 mammal species and approximately 350 bird species. This equates to huge natural diversity and includes the famed 'Big 5' - lion, leopard, elephant, buffalo and rhino. Game drives are conducted through the rolling savannah grasslands and riverine forests that make up this appealing African reserve.